Genuine Westfalia Multivan, 1988 late model. -Sourced Original Multivan Electric Large mirror kit and fitted to original spec. 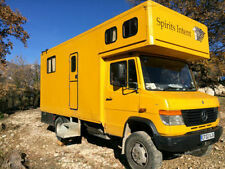 -full ORIGINAL AND VERY SOUGHT AFTER full width multivan R&R bed with original mattress and mattress cover. VW T5 LWB Camper van. This van has a years MOT with no advisories. 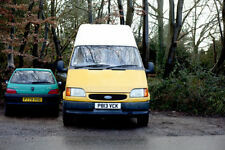 This van has the stronger 2.5 engine and is chain driven not cam belt so will go on for ever. This van can sleep two adults and three children. Loads of history! 240v system. There is also a scuff on the top rear of the side where it brushed past a tree. Full furniture / cupboards / eating table. bluetooth stereo. Waeco CRX50 Fridge (not used). 1997 VW TD4. 180000 miles. Great camper van. Has been SORN all winter. Battery needs charging. Alternator needs replacing. 4 x new tyres. Kyham fitted 4 person tent with large sleeping area. Camping accessories. lots of receipts. Swivel seats driver and passenger. Led lights. Rear speakers. Large Roof box. Vango deluxe awning. Tap and sink. VW T4 Caravelle CL D Camper 2.4L Diesel Long wheel base, twin sliders, barn doors. M.O.T until September 2019 Mileage 150k Excellent condition underneath 3 seats in the cab. Covers are fully washable. Here for sale is my 2008 SWB VW T5 Transporter Shuttle 1.9 diesel. Double Din DAB/DVD player in the front (potential to connect the 2 DVD players up and have movies blaring out of the van speakers!). Seats 4 / optional 5 seater, all front facing with seatbelts. Sunroof with insect blind. Custom birchwood laminate ply conversion. We are a family of two adults and two small children and it worked great for us. VW Transporter T5.1 T30 Kombi Highline 102hp 2014. Being the highline this is top spec. Evo Motion 130cm Slimline units, with overhead locker & over sink cupboard with led light. RIB Altaire 130 sliding bed with Clearcut Conversion crash test support beam. Fantastic condition a must see for sure with a high quality conversion. Very low mileage for the age with the expected wear and tear. MOT runs out in May however will be sold with a full MOT and service. VW T5 TRANSPORTER. D.S.G gearbox. Gloss black caravelle alloy wheels. The middle row of caravelle seats and small table are not with the van, when i got it they were missing and never needed to buy them, but i feel this is reflected in the price compared to all the other caravelle's people are asking £10k for this is a very well priced van. 2015 Volkswagen Caddy Maxi Highline Camper. With Pop-Top Roof In Raven Blue. Van In Excellent Condition. Big Wave Campers. Parking Sensors. Different styles of Alloys to choose From. 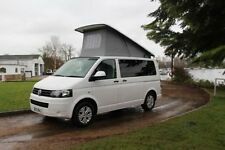 VW T5 1.9 TDI Long Wheelbase High Top. Being sold due to no isofix for baby seat in front. This is a really great much loved Van and a head turner. - This van has been well looked after with many jobs carried out ; Cam belt, water pump, drive shaft plus full service less than 500 miles ago, MOT other receipts. Professionally converted VW T5, 2.0 L Transporter diesel bluemotion stop/start; leather upholstery throughout; 6 seater; rock and roll bed on rails; storage compartments; day battery; beige speckled lino flooring; internal LED lights; front and rear speakers; sat nav; rear parking sensors; cruise control; Air Conditioning; Bluetooth, Handsfree; near side and off side sliding doors; VW alloy wheels (good tread all around); VW service history up to 73,000 miles, local service since. Van is in excellent condition in and out. Well looked after van. Any questions please get in touch. All reasonable offers will be considered. Thanks for viewing. 2005 2.5 T5. MOT till July. It's got a few light scratches down the sides, one or two down to the undercoat and a rippled back wheel arch and a small dent in the bonnet but it generally looks fairly tidy for its age. This is a VW T5.1 sport line face-lift. soft closed draws etc. All work carried out professionally and to a high standard. 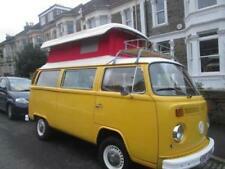 VW t5 T28 104 TDI Camper Van with loads of character. Stan has loads of character as you can see from the photos. 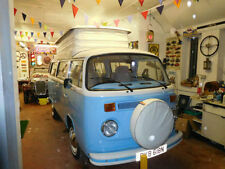 He has been well looked after and has 12 months MOT. The Timing belt and water pump has been changed very recently. I will provide the Vango carpet and groundsheet. I've maintained the van regardless of cost over 9 !! Rotating dining table and movable 3 legged foldable support (can relocate to the awning or outside for alfresco dining! ).